Today, activists of the Break Free coalition have taken part in a funeral procession outside the Department of Energy (DoE) in Pretoria to highlight the impacts that coal-fired power stations are having on South African communities. 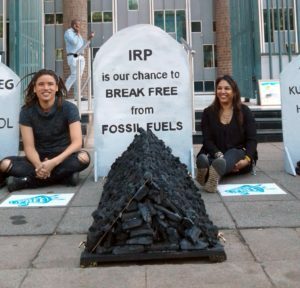 The solemn procession depicted tombstones to which activists were chained with the message “The IRP [Integrated Resource Plan] is our chance to Break Free from fossil fuels” making a call to the South African public to stand up against dangerous and polluting energy options and engage in the electricity planning processes undertaken by the DoE. “Civil society organisations under the Break Free banner reject the IRP current plans as nothing more than renewed attempts by the Department of Energy and Eskom to promote vested interests in nuclear and coal. The long awaited IRP 2016 is a rigged model that forces nuclear energy and coal into the mix, even though it is clearly not cost competitive. The base case proposes a ridiculous scenario for 20 GW of nuclear and 15 GW of new coal by 2050”, stated NhlanhlaSibisi – Climate and Energy Campaigner for Greenpeace Africa. The purpose of the Integrated Resource Plan, in the DoE’s own words, is to identify investments in the electricity sector that allow the country to meet forecasted demand with the minimum cost to the country. As such coal and nuclear have no place in the IRP base case as renewable energy is by far the cheapest technology and should form the backbone of South Africa’s energy mix going forward. We must reduce our dependency on fossil fuels drastically, starting today. “What government and the majority of South Africans don’t see are the real costs associated with living with coal on a daily basis. We need to break from coal dependency that has resulted in SA communities living with some of the worst air quality in the world. Children are ill, water resources are polluted, agricultural land is sterilized, all at a time when there are better solutions available through renewable energy”, stated Makoma Lekalakala – Senior Programmes Officer, Earthlife Africa Johannesburg. Droughts, sporadic rainfall and erratic weather patterns are all indicators that governments should take immediate action to safeguard a future that will sustain future generations. “The impact of climate change is already felt in South Africa, and it affects the most vulnerable among us. We must reduce our dependency on fossil fuels drastically, starting today. Breaking Free from fossil fuels is possible; it will benefit all South Africans and guarantee a bright future for our children. Renewable energy can supply the bulk of the energy our country needs without further damaging our environment. This shift can be done now and must guide us as we plan our energy future”, added Gillian Hamilton, Branch Manager of the African Climate Reality Project. “The government’s case for more coal and nuclear is baseless, ill-considered and destructive. Cost comparisons between coal and nuclear in relation to renewable energy technologies in the Draft IRP 2016 are misleading. The DoE’s lack of political commitment towards renewable energy blocks the country climate action pathway. The urgency could not be more heightened. We are breaking free from rogue industries knowingly perpetuating climate change crisis. The latest math proves that to prevent catastrophic warming, there can be absolutely no expansion of fossil fuel infrastructure. That means no new coal mines, no new drilling, no to nuclear”, continued Ahmed Mokgopo, 350Africa Divestment Campaigner. Break Free is a global wave of people, communities, local and international organisations taking a firm stance against fossil fuels and calling for an end to dirty energy.